Did you know that an acre of almond trees grows 450 pounds of protein and 260 pounds of fiber and the “good” monounsaturated fats that helps keep your heart healthy? But the trees don’t only have healthy food value—they can have health benefits for the environment as well. 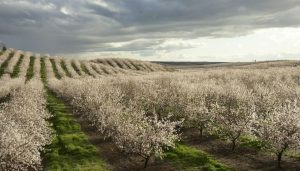 In fact, a well-managed almond orchard could be considered a tool in combatting climate change! Really? How could that be? Well, I imagine you may have heard by now that climate change is caused mostly by the build up of greenhouse gasses such as carbon dioxide in the atmosphere. Guess what trees do? They take carbon dioxide out of the atmosphere via photosynthesis and bring it down into the soil. They also release oxygen into the atmosphere. In many respects you could think of them as a natural filter that cleans pollutants from the air. The health benefits in this are measurable. It is thought that trees and forests of all kinds combined remove approximately 17.4 million metric tons of air pollution in the United States every year. The health benefits are estimated at $6.8 billion dollars per year! How much of that can be attributed to almond trees? It depends on the orchard! The more sustainable the agricultural process, the better the results. We believe in earth-friendly farming at Maisie Jane’s and have a strong philosophy regarding sustainable agriculture. This means that we farm without depleting the earth’s resources or polluting its environment. And, because more than 80% of man-made U.S. greenhouse gas emissions come from burning fossil fuels such as coal, oil, and natural gas, we purchase Green-e® Energy Certified renewable energy for all the energy that we use in manufacturing and packaging our products. Using renewable energy significantly reduces greenhouse gas emissions. And that is an effective strategy for combating climate change.